If you've been getting the urge to replay Baldur's Gate, you might want to wait til this fall. 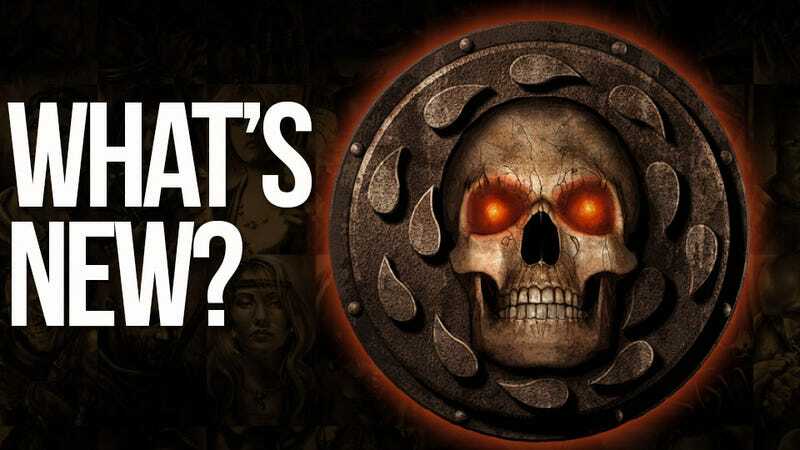 The classic role-playing game will see new life on September 18, when developer Beamdog releases Baldur's Gate: Enhanced Edition, an enhanced remake with new characters and a new adventure that the company says will take you six hours to play through. PC and Mac versions of the game will run you $20 unless you pre-order, in which case they'll be $18. They'll come with three new playable sidekicks: half-Orc Blackguard Dorn (whose head is pictured below), half-elf Wild Mage Neera, and human monk Rasaad. Baldur's Gate: Enhanced Edition will also feature a new dungeon called The Black Pits, set within the Underdark, that tasks you with fighting your way through fifteen levels of arena-style battles. The iPad version, which Beamdog is hoping to release around that same time in September, will cost $10. The interface for this version will be totally retooled so it's pleasant to play on your tablet. However, new characters Dorn and Neera will be sold separately as downloadable content for the iPad edition. Additional voice sets and portraits will also be DLC. The new Black Pits adventure is included with the game. Baldur's Gate: Enhanced Edition will also come to Android. Release TBA. This version of Baldur's Gate will also feature the classes, kits, and races that were available in Baldur's Gate II. It squashes a whole bunch of the original version's bugs and also offers cross-platform multiplayer among all versions. Come one, come all! Baeloth the Entertainer cordially invites you to the greatest spectacle the realms have to offer - mortal pitted against mortal in a desperate bid to survive! Thrilling combat, scintillating magic, and the grim spectre of death lurk above this, the greatest of all shows! All this and more can be enjoyed within... THE BLACK PITS! Deep within the Underdark where few dare to tread, the mad drow Baeloth has used his extensive mastery of magic to force a duergar colony into creating an entertainment complex of his own design. He has invited guests from across the realms, from Maztica to Menzoberranzan, and they will readily attend - Baeloth is known to be an excellent showman. The Black Pits is one of the enhancements that make up Baldur's Gate: Enhanced Edition that allows you to create a full party and battle through fifteen hellish battles in a desperate bid to escape. Difficult challenges, unique battles, and a bizarre cast of characters await you within the Underdark! The Black Pits are your new home... enjoy your stay while you can! "Do not annoy me with such simplistic notions of morality." Born in the Spine of the World, Dorn fled to Luskan with his human mother when a rival tribe annihilated his father's savage people. In that northern city, Dorn's ruthless strength soon won him a deadly reputation and the attentions of a band of mercenaries whose wickedness exceeded even Dorn's. Imprisoned for the crimes of the entire group, Dorn made a fiendish bargain granting him even greater power and the promise of revenge. A Blackguard of few words, Dorn is only too happy to ally himself with a child of Bhaal and cut a bloody swath across the Sword Coast with his black greatsword, as long as that path continues to lead him to the traitors he has sworn to destroy. Dorn is a half-orc Blackguard whose otherworldly patron grants him terrible powers in the form of his black sword and unholy spells. Add him to your Baldur's Gate: Enhanced Edition and inflict evil to the last corpse. Betrayed by his former companions, the half-orc Dorn Il-Khan lusts for revenge and glory in equal measure. Beamdog's Cam Tofer has promised that an enhanced edition of Baldur's Gate II is also en route. The team has also expressed interest in remaking or revisiting other Infinity Engine-based isometric RPGs like Planescape: Torment in the near future. And one day, maybe, they'll start working on a Baldur's Gate III. Maybe.